The Despicable Me series may not consist of any animated masterpieces, but it has been consistently entertaining with its first two entries. Though its 2015 spinoff film, Minions, never quite hit the right notes, the third proper entry in the Despicable Me franchise serves as a return to form for the series. Like its predecessors, Despicable Me 3 isn’t aiming to be an animated classic, but it does succeed in being a fun, colorful ride that – despite an overstuffed plot – is every bit as funny and entertaining as it’s ever been. 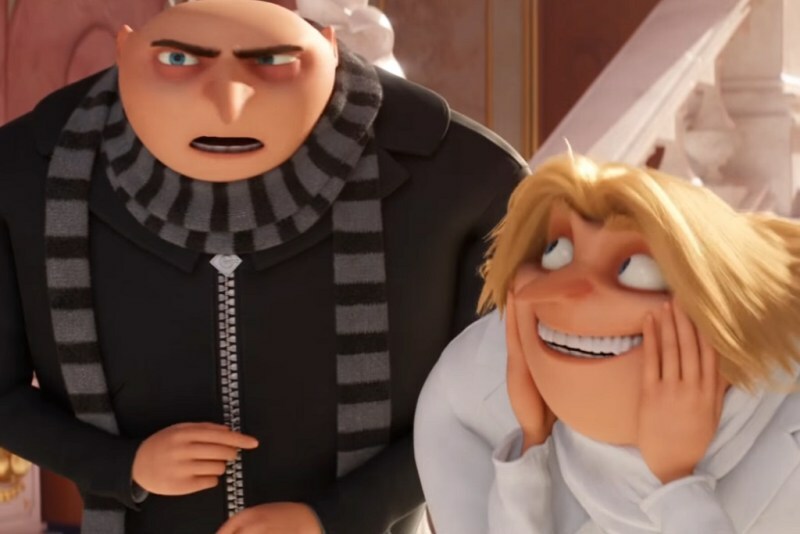 In Despicable Me 3, former villain Gru (Steve Carell) and his new wife Lucy (Kristen Wiig) have become leading agents of the Anti-Villain League, though a persistent villain named Balthazar Bratt (Trey Parker) – a former child-star of the 1980s who went mad after his series was cancelled once he hit puberty – has proven to be a continuous thorn in Gru and Lucy’s side. After Bratt makes another cunning escape from Gru and Lucy, the Anti-Villain League’s new management fires the married agents. Gru is downtrodden at the loss of his and his wife’s jobs, and seeks revenge on Bratt. But things get all the more complicated when Gru learns he has a long-lost twin brother named Dru (also Steve Carell). So Gru and Lucy; along with their adopted daughters Margo, Edith and Agnes, pack up their bags to go and meet Gru’s brother. If this scenario sounds like two very different plots, that’s because, well, it kind of is. Despicable Me 3 suffers from a similar problem to the second installment in that it just has way too much going on. Not only do we have two different main storylines, but also a few too many sub-plots: All but two of the Minions quit working for Gru after learning he won’t be returning to villainy after being fired from the AVL, Lucy is still trying to fit into her role as a mother, and Agnes is preoccupied with finding a real-life unicorn. 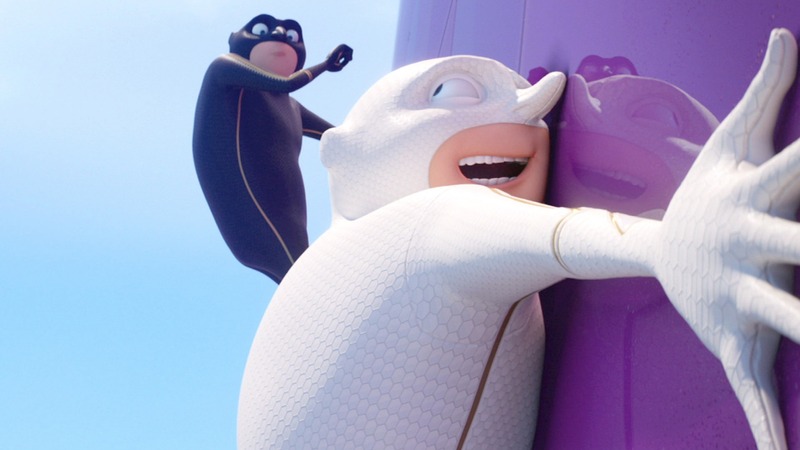 It’s all a bit overstuffed, to the point that many of the series’ characters don’t have a lot to do amidst it all (even with Agnes’ side story, Gru’s daughters have a largely reduced role; and Gru’s loyal inventor Dr. Nefario has been written out of the plot entirely – albeit by the comical means of accidentally freezing himself in carbonite). And frankly, the plot involving Gru’s relationship with his brother feels a bit half-baked, with the goings-on between Gru and Balthazar being far more entertaining. So there’s a lot going on, and many aspects of the film feel underdeveloped due to it. We’ve got that covered. However, like its predecessors, Despicable Me 3 is ultimately good fun due to its sense of humor and wildly stylized animation. 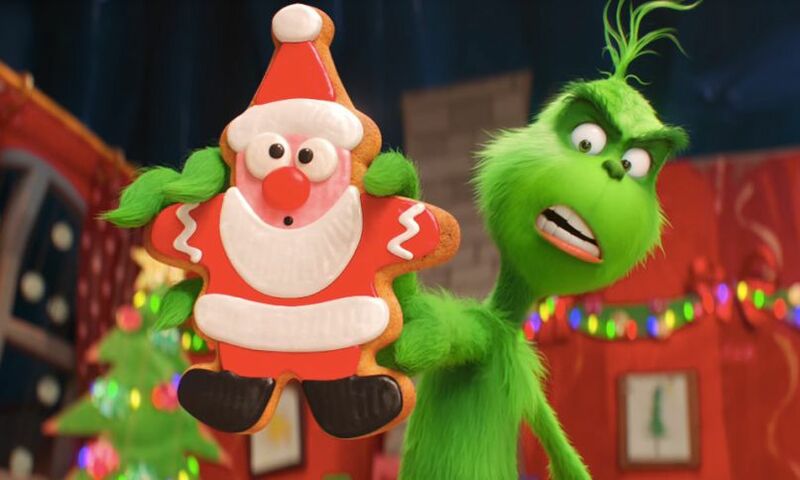 Illumination Entertainment never seems to be trying to compete with the likes of Pixar in terms of storytelling, and their films are more akin to Saturday morning cartoons than the more sophisticated animated fare of today (which is why the cluttered plot is a little more forgivable here than it would be elsewhere). Their animation style has always been distinctly exaggerated, what with Gru’s hunched back, goblin nose, and non-existent neck. And Illumination’s stories have always been more focused on the gags than the stories themselves. That’s all as true here as it’s ever been. The animation is beautifully constructed, but the characters are a wide assortment of the cutesy and the quirky, and the more cartoonish tone means that the character’s can move in such exaggerated ways that it’s often hilarious just to see them in motion. While the plot may stumble, it’s filled with many elements that, on their own, are quite entertaining. The Minions’ misadventures away from Gru, while maybe a bit sidetracking, provides some good laughs. 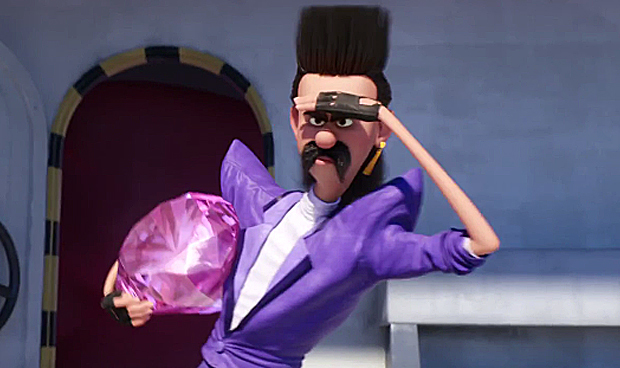 And Balthazar Bratt has become my favorite character in the franchise, with his indelible 80s gimmick that’s present in both his appearance and actions – from playing iconic 80s tunes to accompany his crimes to feeling the need to spout his cheesy catchphrase every time he’s pulled off a heist (“I’ve been a bad boy!”) – the mullet-adorned villain is a constant show-stealer. If you liked either of the previous Despicable Me movies, then no doubt you’ll enjoy Despicable Me 3. If you’re craving a more intellectually or emotionally stimulating animated feature, you’d best look elsewhere. But if you just want to soak in some colorful, cartoonish silliness, then Gru and company once again succeed in providing the laughs. I usually like to make a distinction between “animated films” and “cartoons.” The term “cartoon” is sometimes seen as a dismissive connotation, though I don’t necessarily think that it should be. It just describes a different side to animation. 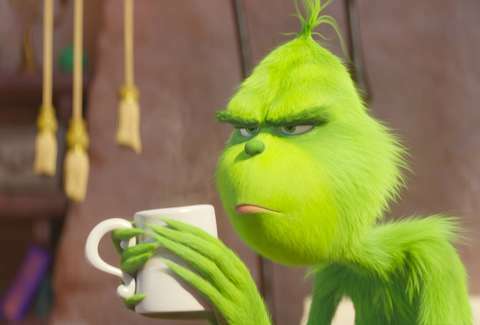 While the animated film side tends to focus on storytelling, those that fall under the category of cartoon tend to emphasize comedy and silliness over anything else. While most of the big animation studios of today are trying to push the boundaries of animated films, Illumination Entertainment (creators of the Despicable Me franchise and its popular Minion characters) proudly churns out feature-length cartoons, with a visual quality that greatly benefits their humor. As such, their works are hardly groundbreaking, but they provide fun doses of escapism. Illumination’s 2016 feature, The Secret Life of Pets, continues this tradition. As its title implies, The Secret Life of Pets shows audiences what our pets are up to when we aren’t around. Ritzy poodles listen to heavy metal, birds find ways to create flight simulators, and some really do just sit around and wait for their owners to get home. 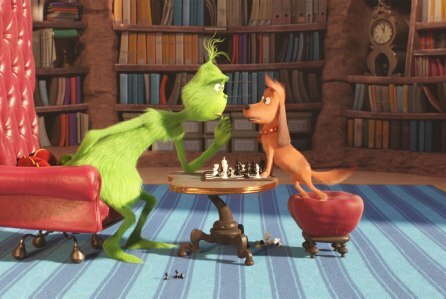 It’s a simple enough setup, and not entirely original (talking animals are pretty run-of-the-mill in the animation world, and one could argue the concept is a kind of knockoff of Toy Story, but with household pets filling in for the toys). But it makes for some decent family comedy. The plot centers on a terrier named Max (Louis C.K. ), who becomes jealous when his owner Katie brings home a second dog from the pound. 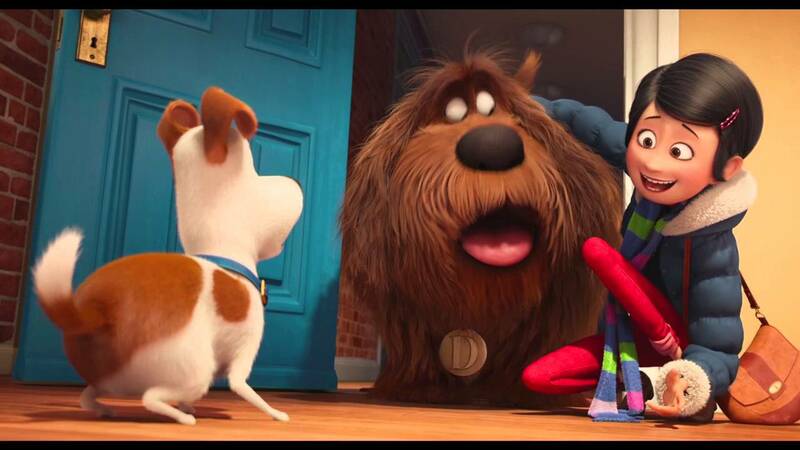 This other dog is Duke (Eric Stonestreet), a large, shaggy mutt who is well-meaning, but is quick to take offense to Max’s jealous attitude (once again echoing Toy Story, and the dynamic between Woody and Buzz Lightyear). The two dogs then become something of rivals. And one day, when Katie is at work, her dog-walker loses control of Max and Duke during one of their feuds. A band of stray alley cats remove the dogs’ collars, and soon enough, Max and Duke end up lost in the city, and go on an adventure to try to find their way back home to Katie. All the while Max’s dog neighbor, a Pomeranian named Gidget (Jenny Slate) begins a search party comprised of other local pets on a quest to find Duke and Max (but mostly Max, with whom Gidget is infatuated). Like Illumination’s other features, The Secret Life of Pets is an incredibly simple film, but it provides some good, lighthearted fun that can be hard to resist. The opening moments of the film give a series of glimpses into the film’s concept, which provide some good humor (even if the trailers may have spoiled a good deal of the earlier gags in the film). Once Max and Duke set out on their adventure, however, is where the film tries a more honest bit of storytelling, with some inconsistent results. When the story is centered more on the humor and the hectic action, it stands strongly enough. But the attempts at more sentimental moments – though an appreciated effort – ultimately fall flat, due to the characters’ largely one-dimensional personalities and lack of proper build-ups. 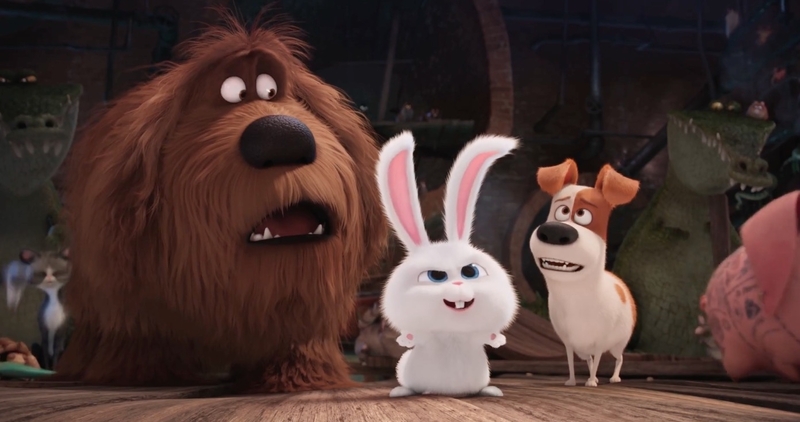 It’s fun to see what antics Max and Duke find themselves in – particularly when they involve Snowball (Kevin Hart), a psychotic bunny who hates domesticated pets – and Gidget’s rescue mission works well enough as a humorous distraction. But there’s just something that feels off when the film tries to get more emotional. While Toy Story managed to masterfully pull-off a strong, emotional story amid its imaginative setup and more humorous aspects, The Secret Life of Pets only really seems to fully grasp the comedy in its concept. Again, Illumination should get an ‘A’ for effort for trying to put some heart in the film (if only the Minions had been so lucky in their spinoff flick), but the emotion just feels clunky in execution. With all that said, the comedy bits do work well enough to get some strong laughs from younger audiences, and maybe even a few from the adult crowd. Plus, they are complimented by Illuminations usual trend of fluid, cartoony animation, making it another great example of the studio’s knack for visual comedy. 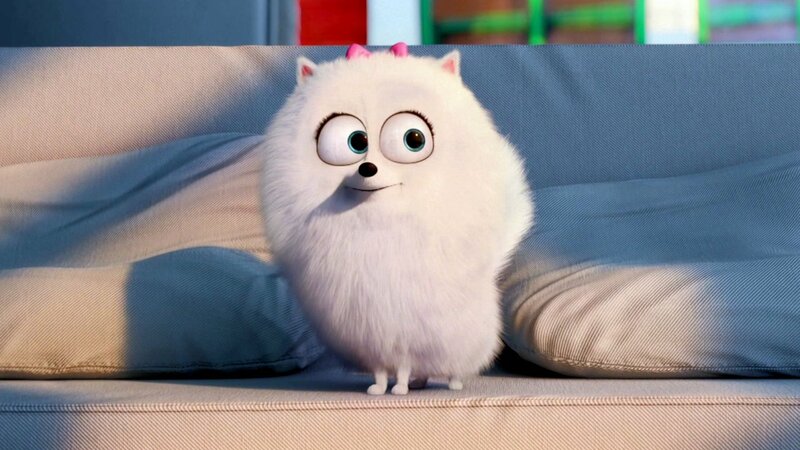 The Secret Life of Pets may not be groundbreaking, or even remotely original. But it does what most of Illumination’s films do by giving audiences a roller coaster of vibrant colors, cute characters, and a harmless, irresistible charm. Illumination Entertainment is a curious entity in the world of animation. While many of the bigger animation studios today are aiming to break new artistic ground and push their storytelling in new directions with their animated features, Illumination sits comfortably with prioritizing cartoonish slapstick and traditional silliness over plunging into deeper waters. It hasn’t exactly hurt them, as the Despicable Me studio has consistently produced box office successes, even if their output is on the more mundane side when stacked against its competitors. But does Illumination’s newest feature, Sing, break the mold for the studio? The short answer to that is a disappointing no. Though on the more positive side of things, Sing is a better movie than its rather atrocious trailers let on. Sing takes place in a world of anthropomorphic animals. Not exactly the most original setup for an animated film, and unlike Disney’s 2016 animated feature Zootopia, Sing doesn’t really do anything new or fun with the concept. It’s an animated film, so the characters are animals. Fair enough, I suppose. What is interesting about Sing’s setup is that – unlike most animated features – Sing is an ensemble film. 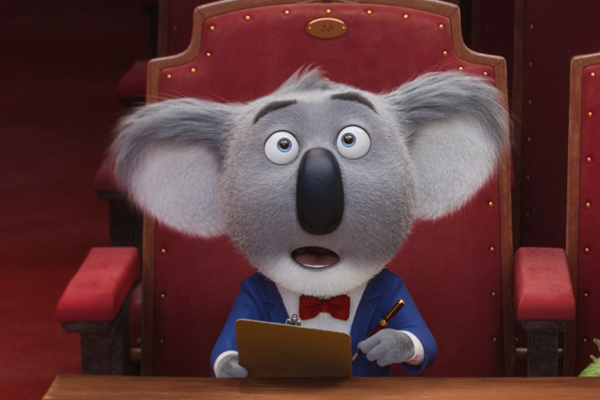 A koala named Buster Moon (Matthew McConaughey) owns a musical theater, but has never seen a hit make its way to his stage. As such, the theater is in financial troubles, so Buster decides to host a singing competition in hopes of reigniting interest in his theater. Here’s where the ensemble setup comes in, as Sing tells multiple character arcs within its overarching plot through the competitors in said competition as well as Buster himself: Rosita (Reese Witherspoon) is a pig who abandoned her dreams of being a singer to become a housewife, and sees the competition as a means to live her lost dream. Ash (Scarlett Johansen) is a punk-goth porcupine teenager who wants to show her potential as a songwriter. 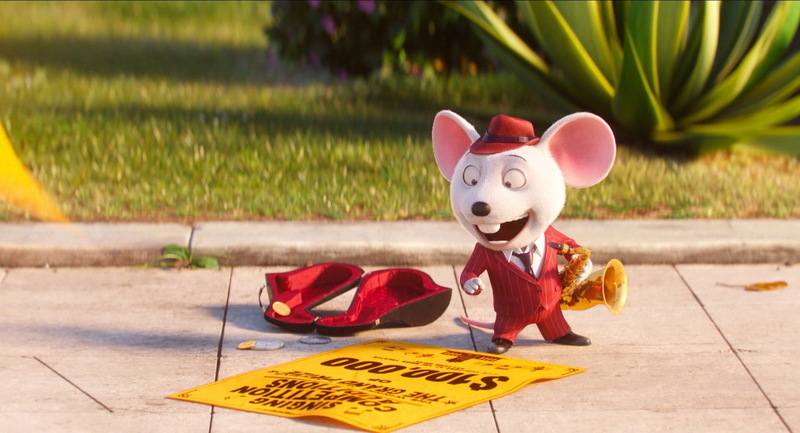 Mike (Seth MacFarlane) is an arrogant street performer mouse who simply wants to win a lot of money. Meena (Tori Kelly) is an unspeakably shy teenage elephant who wants to overcome her fears. And Johnny (Taron Egerton) is a young gorilla and the son of a criminal who wants to give up his family’s life of crime to be a singer. Admittedly, the characters and their story arcs are nothing we haven’t seen many times before in animated films, but Sing actually manages to juggle all these narratives surprisingly well, with each character and story getting a good amount of time to develop. On the downside of things, many elements of the film’s plot can feel a little dated. The entire setup of a singing competition feels a bit late to the Capitalizing-on-American-Idol’s-Popularity party, and the sheer excess in popular songs (many of which are only heard in seconds-long snippets) feels more akin to the animated films from a decade ago than the more original music-focused animations of today. Again, the film ultimately works better than the marketing would have had you believe due to the focus being more on the character arcs, but you can’t help but feel that much of the film feels incredibly… 2004-ish. On the animation front, Sing is quite pleasing to look at. The animation is fluid and detailed, and the character designs (while maybe lacking in variety when two of the same animal are onscreen) are fun and colorful. The visuals help liven up the film even in its weaker, more predictable moments. 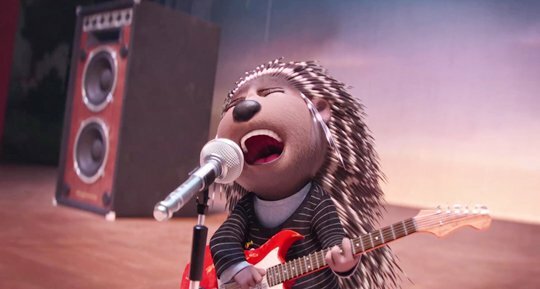 Overall, Sing is decent enough entertainment that may trend on Illumination’s familiar ground of solid but unspectacular features, but it does provide some good fun when it wants. Younger audiences will certainly enjoy it, and while it may not have the adult sophistication of Zootopia, it’s lighthearted charms might win over some older audiences as well.